It is highly recommended to configure log upload using Docker for more flexible deployment. I/O performance of the virtual machine - determines the speed at which logs are written to the log collector’s disk. The log collector has a built-in safety mechanism that monitors the rate at which logs arrive and compares it to the upload rate. In cases of congestion, the log collector starts to drop log files. If your setup generally exceeds 50 GB per hour, it's recommended to split the traffic between multiple log collectors. In the Cloud App Security portal, click the settings icon , followed by Log collectors. e. Set the Receiver type to either FTP or Syslog. For Syslog, choose UDP, TCP, or TLS. f. Click Add to save the data source. Repeat this process for each firewall and proxy whose logs can be used to detect traffic on your network. c. Select all Data sources that you want to connect to the collector. Click Update to save the configuration and generate an access token. Copy the contents of the screen because you will use it when you configure the Log Collector to communicate with Cloud App Security. If you selected Syslog, this information includes information about which port the Syslog listener is listening on. If you accept the end-user license terms, Download a new log collector virtual machine by clicking on Hyper-V or VMWare. Then, unzip the file using the password you received in the portal. The following steps describe the deployment in Hyper-V. The deployment steps for VM hypervisor are slightly different. Select New and then Virtual Machine and click Next. Provide a Name for the new virtual machine, for example CloudAppSecurityLogCollector01.then click Next. Change the Startup memory to 4096 MB. Check Use Dynamic Memory for this virtual machine and click Next. If available, choose the network Connection and click Next. Choose Use an existing virtual hard disk. Select the .vhd file that was included in the Zip file you downloaded. The machine is added to your Hyper-V environment. Click on the machine in the Virtual Machines table and click Start. The virtual machine is pre-configured to obtain an IP address from a DHCP server. If you need to configure a static IP address, default gateway, hostname, DNS servers, and NTPS, you can use the network_config utility or perform changes manually. At this point, your log collector should be connected to your network and should be able to reach the Cloud App Security portal. 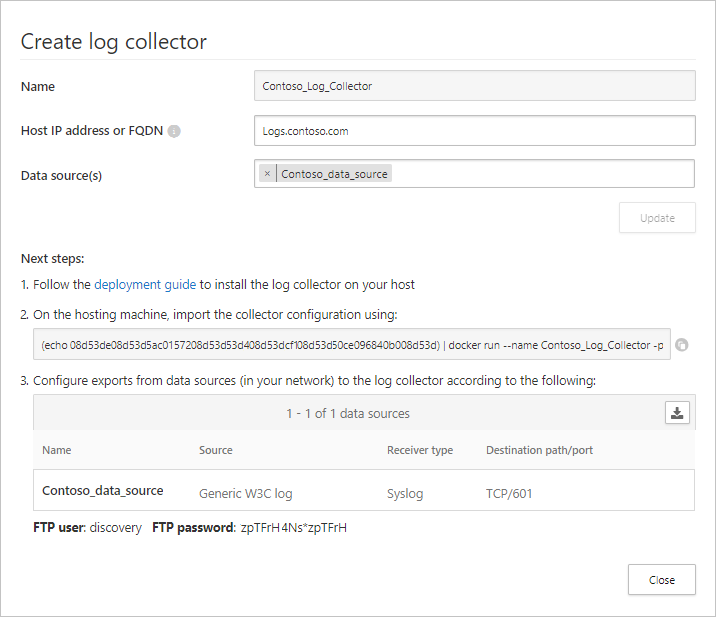 The first time you sign in to the log collector and import the log collector's configuration from the portal, as follows. Enter your console domain, for example: contoso.portal.cloudappsecurity.com This is available from the URL you see after logging in to the Cloud App Security portal. Enter the name of the log collector you want to configure, for example: CloudAppSecurityLogCollector01 or NewYork from the preceding picture. a. Sign in to the log collector over SSH using the Interactive admin credentials provided to you in the portal. Check the collector status in the Log collector table and make sure the status is Connected. If it's Created, it's possible that the log collector connection and parsing haven't completed. Go to the Governance log and verify that logs are being periodically uploaded to the portal. After you've verified that the logs are being uploaded to Cloud App Security and the reports are being generated, you can create custom reports. 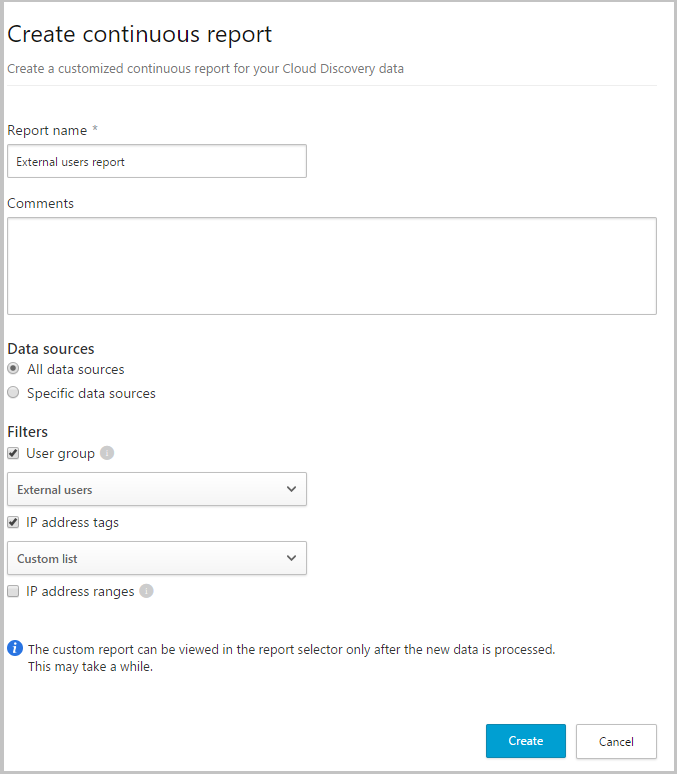 You can now create custom discovery reports based on Azure Active Directory user groups. For example, if you want to see the cloud use of your marketing department, you can import the marketing group using the import user group feature, and then create a custom report for this group. You can also customize a report based on IP address tag or IP address ranges.